Free To Do List Printables for Every Day of the Week! You are here: Home / Family Freebies / Free To Do List Printables for Every Day of the Week! Is your day planned around a to-do list? (Mine is!) 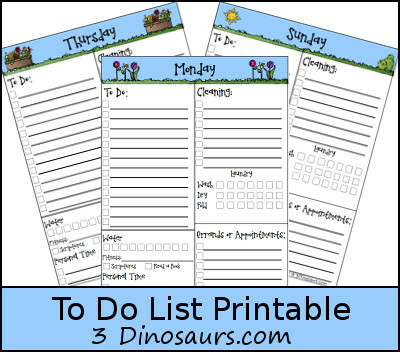 If your days run more smoothly with your tasks planned out, make sure you head over to 3 Dinosaurs and download this set of To Do List Printables. You’ll find a beautiful set of to-do lists for each day of the week! Items include: cleaning, fitness, laundry, errands, and more.